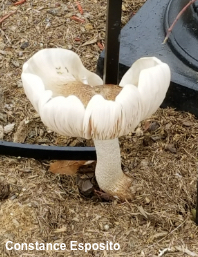 This mushroom can cause quite a little confusion. 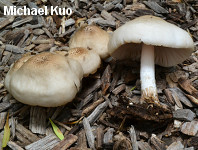 Its gills remain white for quite a long time (as compared to its close relative, Pluteus cervinus), and it is more likely to be found growing from woodchips, buried wood in urban areas (especially where trees have been taken out within a year or two), woody mulch, or sawdust, appearing terrestrial rather than popping out of a stump. 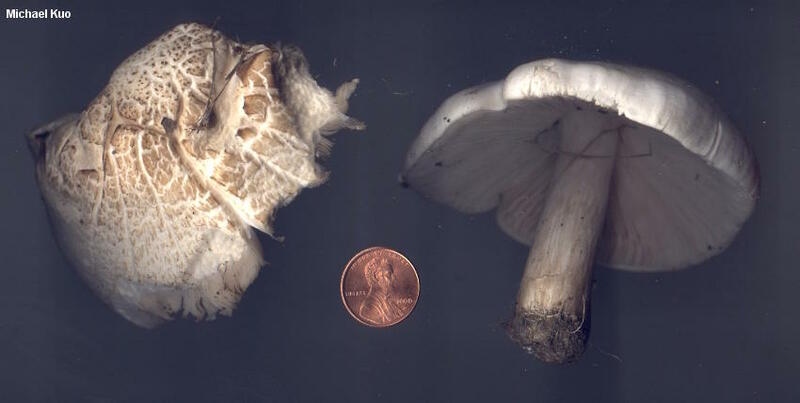 However, the gills do eventually turn Pluteus-pink, and once they do, the same factors that were confusing at first become useful features for identification--coupled with the fact that the cap is usually (but not always!) whitish to very pale brown, with fine brown scales over the center. For certain identification, however, microscopic features should be checked, since cervinus-like collections of Pluteus petastus (and petasatus-like collections of Pluteus cervinus) are not uncommon. 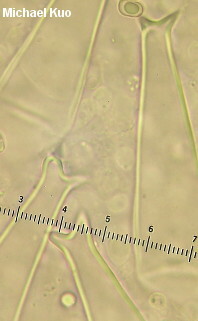 Pluteus petatus has slightly smaller spores than Pluteus cervinus, and its cheilocystidia are much less frequent. 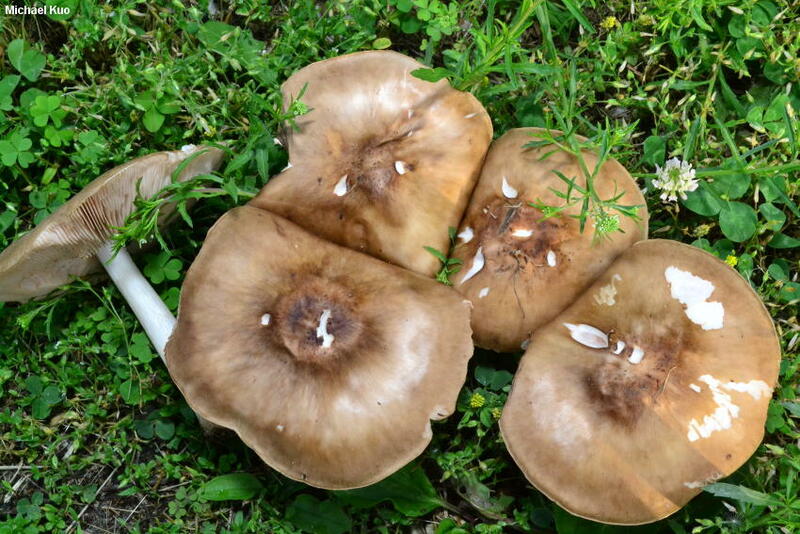 Additionally, and perhaps more easily assessed, Pluteus petasatus features abundant, fusiform "intermediate cystidia" that have not yet developed the apical prongs of mature pleurocystidia. 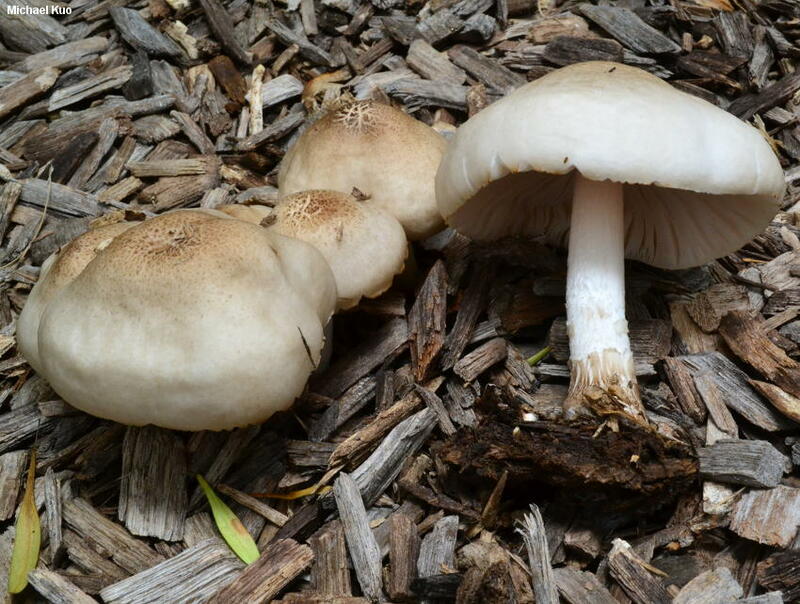 Thanks to Constance Esposito for collecting, documenting, and preserving Pluteus petasatus for study; her collection is deposited in The Herbarium of Michael Kuo. Ecology: Saprobic on the deadwood of hardwoods, but frequently found in woodchips, woody mulch, sawdust piles, and the like; often appearing in urban areas, especially where trees have been removed within one or two years; often growing from buried wood and appearing terrestrial; growing alone, gregariously, or, more often, in loose clusters; late spring through fall, or over winter in warm climates; widely distributed and common in North America east of the Rocky Mountains, and occasional in western North America. The illustrated and described collections are from Illinois and Georgia. Cap: 5-14 cm; convex at first, becoming broadly convex or nearly flat, with or without a shallow central bump; tacky when fresh but soon dry; bald when young, becoming finely scaly over the center; color variable--usually whitish or very pale brown, with a darker, browner center, but sometimes medium to dark brown; the margin not lined, but often splitting radially in places by maturity. 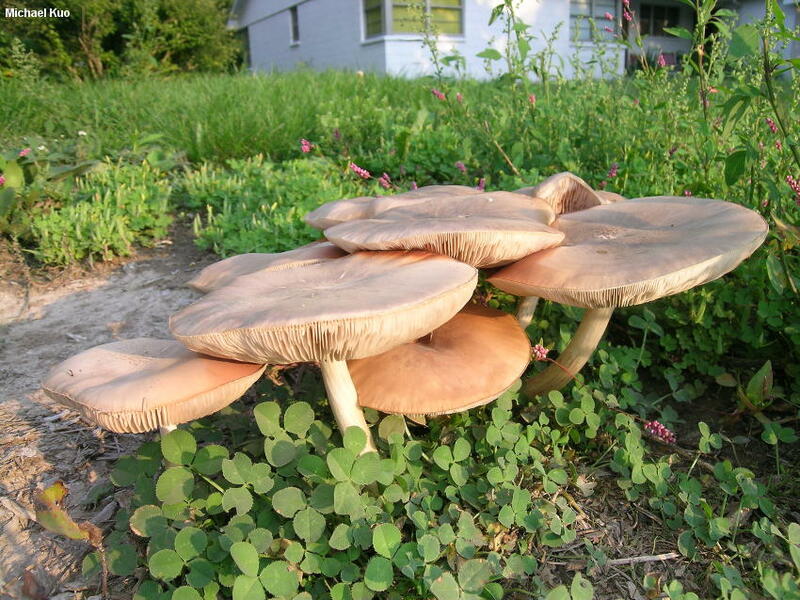 Gills: Free from the stem; close or crowded; short-gills frequent; white at first, and remaining so for quite a while--but eventually pink to brownish pink. Stem: 3.5-12 cm long; 4-20 mm thick; more or less equal, or with a slightly enlarged base; dry; bald or, toward the base, finely fibrillose or shaggy; whitish, discoloring brownish to brown below; basal mycelium white. Flesh: Firm and white throughout; unchanging when sliced. Odor and Taste: Not distinctive, or very faintly radishlike. 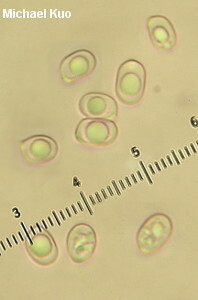 Microscopic Features: Spores 5–8 x 3.5–6 µm; ellipsoid; smooth; hyaline and uniguttulate in KOH; inamyloid. Cheilocystidia scattered and infrequent; clavate to sphaeropedunculate; hyaline in KOH; thin-walled. Intermediate cystidia often abundant; fusiform, without apical projections; thick-walled; hyaline in KOH. 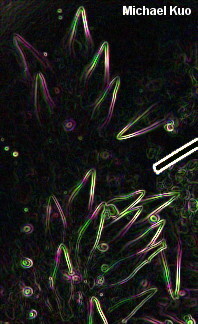 Pleurocystidia 50–90 x 10–25 µm; lageniform with a flared apex; with 2–4 apical hooks; hooks entire; thick-walled; hyaline with faintly ochraceous walls in KOH. Pileipellis a cutis or slightly gelatinized cutis; elements 4–7 µm wide, hyaline or brownish in KOH, smooth, septate, not clamped; terminal cells cylindric with rounded apices. REFERENCES: (Fries, 1838) Gillet, 1876. (Saccardo, 1887; Singer, 1956; Smith, Smith & Weber, 1979; Arora, 1986; Vellinga, 1990; Phillips, 1991/2005; Banerjee & Sundberg, 1995; Bessette, Miller, Bessette & Miller, 1995; McNeil, 2006; Kuo, 2007; Justo et al., 2011a; Justo et al., 2011b; Justo et al., 2014; Kuo & Methven, 2014.) Herb. Kuo 06170205, 09280505, 10040501, 05281302, 06071304, 02221801.